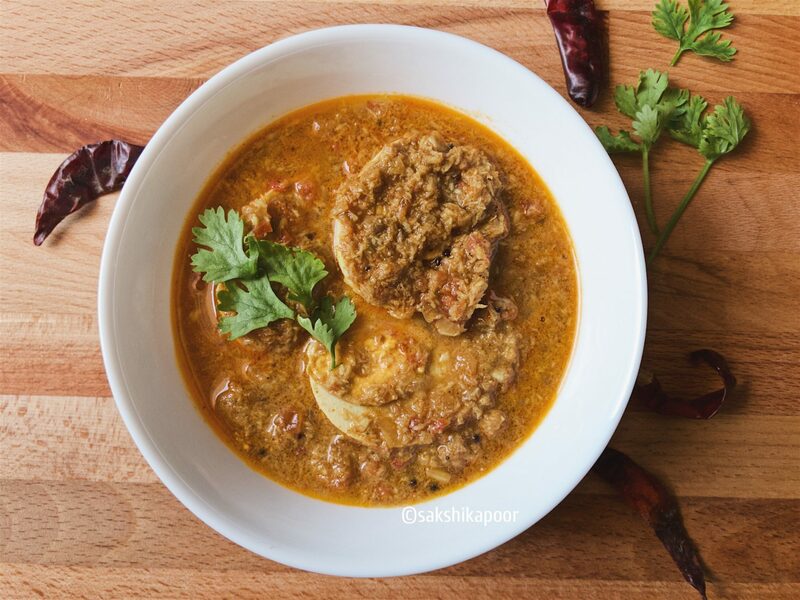 And what better way to make a healthy, hearty, protein rich meal than to make a batch of Egg curry to be devoured with roti or rice? It is one of my go-to recipes when I’m out of ideas or veggie supplies or just out of inspiration to come up with something new. But there is something new here too. I have grown up eating a simple spicy egg curry that is based on just onions and tomatoes and have loved it. But recently, I tried making a coconut based egg curry that I’d had at my in-laws’ place. From some of my previous posts, you’ll figure that I’m a new fan of using coconut in curries and stir fries. It definitely does makes everything yummier. Just in case you don’t enjoy coconut in your food, you can make this curry without it. It’ll be a little different but still be yummy! 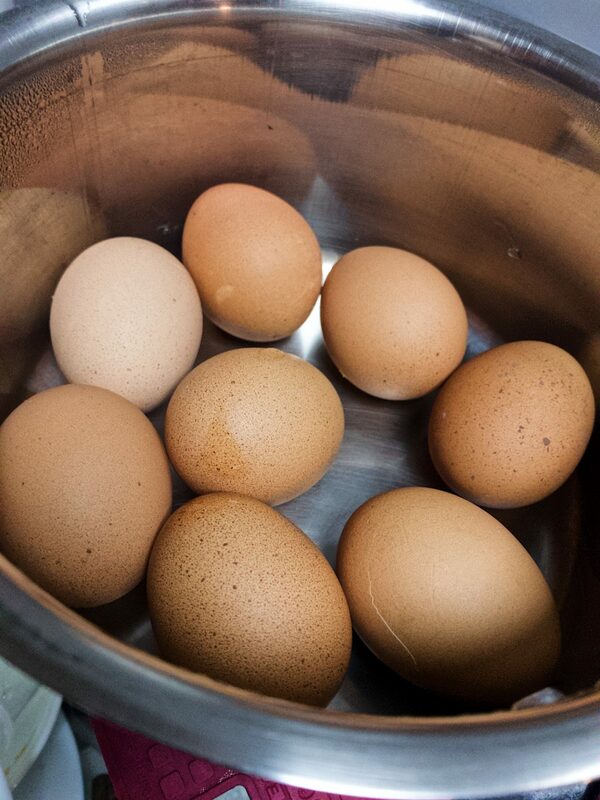 In a big pan, place all the eggs and fill it with room temperature water. Cover the pan and place on medium high heat for 8-9 minutes. Keeping a timer handy would be helpful. After 8-9 minutes of cooking, carefully drain the pan off the boiling water and keep aside to cool. Peeling hot eggs can be tricky so you may peel the eggs using certain techniques like shocking the boiled eggs in ice cold water. Use whatever technique that works for you. Now for prepping the ingredients for the actual curry. Start with finely chopping onions and garlic together. For the tomatoes, a purée would be perfect but if you don’t have a processor just chop them finely. 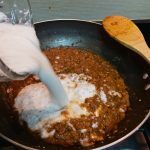 If you are using the coconut in the curry, you would need to prepare a coconut paste that would be added at a later stage in the curry. 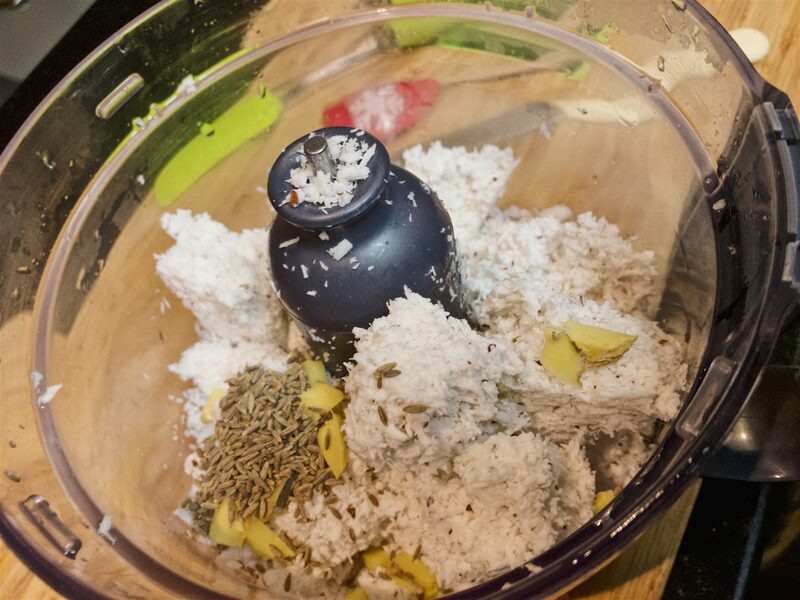 In a blender or food processor, put grated coconut, ginger, green chilli and cumin seeds with some warm water and make a smooth paste. Keep this aside. 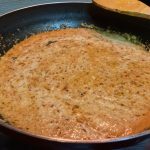 To start with the curry, put a kadhai on medium high heat and add some oil. Once the oil is hot, add the mustard seeds and wait for them to crackle. 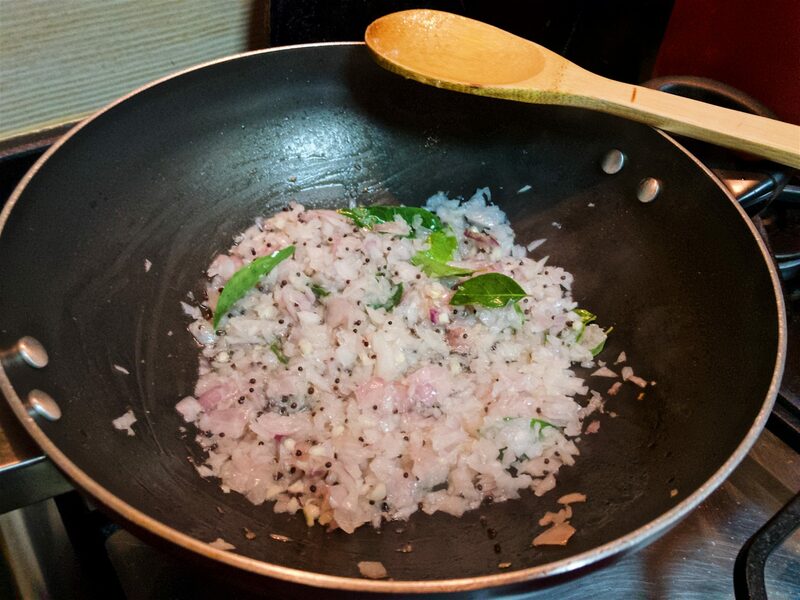 Next add the chopped onions and garlic with the curry leaves. Cook these till the onions are a light golden. Keep the heat to a medium and stir occasionally to keep the onions from burning. Once the onions are light golden, add the tomato purée followed by salt, coriander powder, red chilli powder, turmeric and garam masala. Cook for 2-3 minutes and then add a cup of water so that the spiced do not burn. Cook this by stirring occasionally till this masala starts to leave oil on the sides. Once the oil comes on the sides, add the coconut paste. Turn the heat to medium low now and stir. Once you add the coconut, don’t let the curry to come to a boil since we don’t want the coconut paste to curdle. 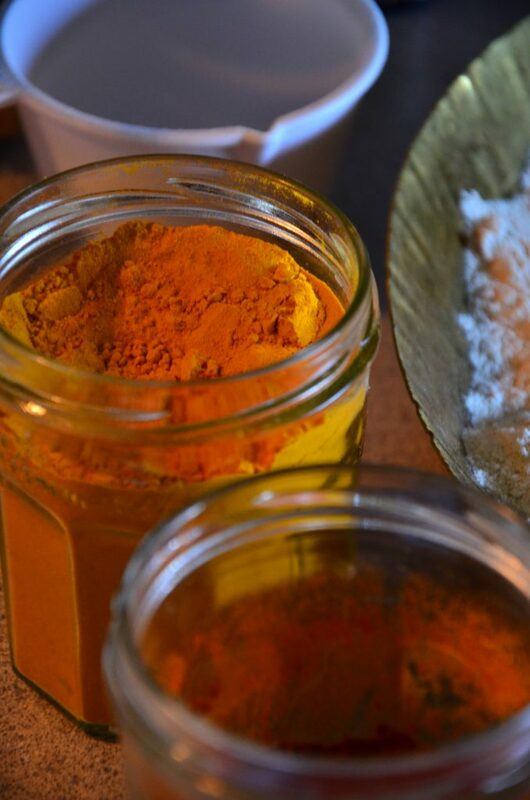 It’s better to cook the curry on low if you are using coconut milk or paste. 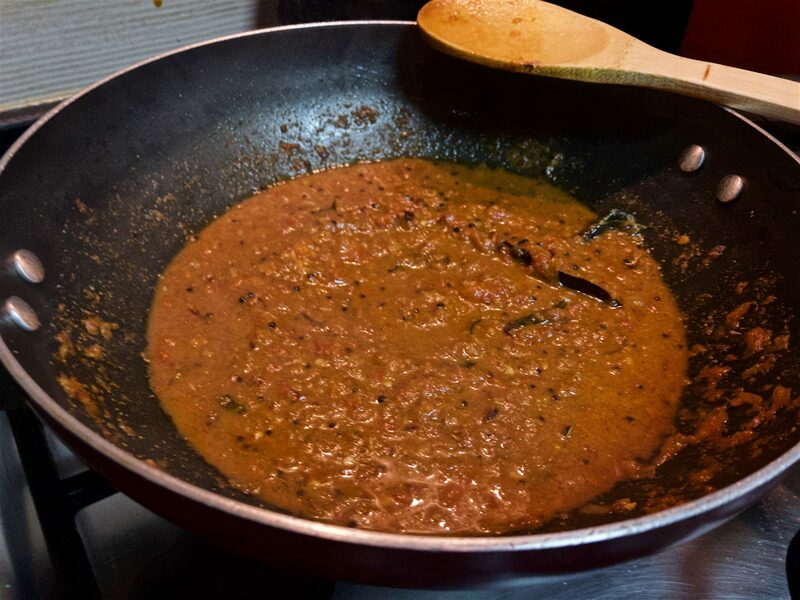 If you are not using the coconut paste, adjust the thickness of the curry by adding more water, if needed. This curry is better when it is thicker. Wait for the curry to come to a rolling boil before you proceed to the next step. 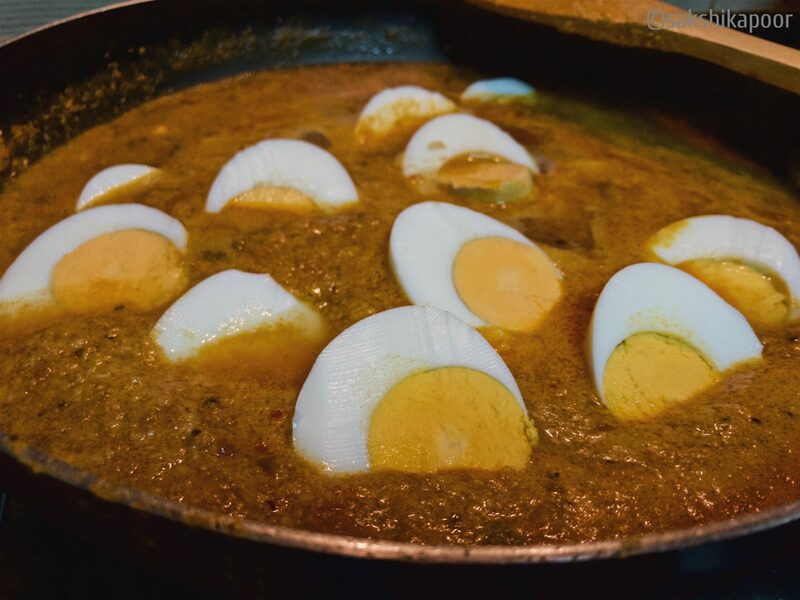 Eggs peeking from the curry! 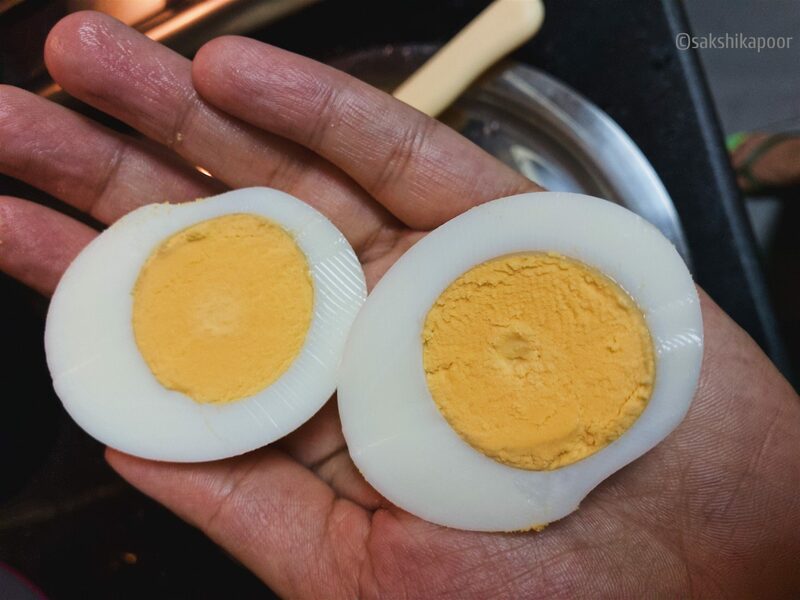 Slice all the boiled peeled eggs into halves and start placing them in the curry. Stir the curry gently so as to not disturb the eggs. Cook for 5-7 minutes on medium low heat and it’s done! Top with some fresh coriander leaves or cilantro and serve with steamed rice or chapatis! P.s. If you’re making the coconut version, it’ll be even better the next day! Also, when reheating the coconut version of the curry, don’t bring it to a boil. Oh my does this look good! I’ve never seen anything like it! Really? You must try it then! Even if you don’t make the coconut version, the boiled eggs are still quite nice in a spicy curry. You can serve them with a flatbread or steamed rice.